Create additional profits and provide superior accuracy in your examinations by incorporating ultrasound in the procedures you are offering your patients. Benefits to you: Increased accuracy and significant additional reimbursements (see below). Also remember ... increased patient satisfaction is going to translate into increased referrals! And consider the effect it will have on your advertising if you are able to include ultrasound in the services you provide! Benefits to your patient: Superior diagnostic and clinical applications, more accurate injections and needle placements, and the enjoyment of seeing the ultrasound images of what you are describing to them — and of watching, over time, the changes in their conditions. 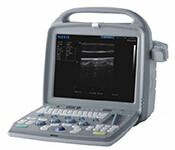 Diagnostic Ultrasound, extremity, non-vascular, B-scan and/or real time imaging with image documentation. Average Medicare reimbursement: $25 to $125. On the lower end of the scale, you would have CPT 76882 which is the code you would use if you were looking at plantar fascia, at neuromas, at tendons, etc., while the higher-paying CPT 76881 would be used if you were capturing multiple images from different angles, for example in imaging a joint. Ultrasonic guidance for needle placement (e.g., biopsy, aspiration, injection, localization of device), imaging supervision and interpretation. The average reimbursement for ultrasound-guided injections is $150 - $200 on top of what you are collecting for the injection (or aspiration) normally. You will pay it off in ABOUT SIX WEEKS. Your ROI the first year alone will be 600%. Across two years, your ROI will be 1200%. Would an investment returning 600% in the first year alone be an investment worth making? And don't forget that by implementing the systems we recommend, you will also see a boost in your referrals ... What would a few extra clients a month mean for you? You will meet (and exceed) your monthly payment — on the first day of each month. And your ROI on your monthly investment will be over 2,000%. If you could write a check each month, and have someone write you a check in return for twenty times that amount ... would you write that check? And what if you could finance it and go three (or even six) months before your first payment? How many procedures would you be performing? Assuming you see at least one patient each day with plantar fasciitis or with a neuroma or with a torn or ruptured tendon ... or give at least one injection per day ... you can be sure of earning at least $100 per day with your ultrasound. We encourage our clients to try to pull out their ultrasounds at least once every morning and once every afternoon, whether for a standard exam or for an injection. If you can use your ultrasound on two patients each day, you are earning $200 a day, or four grand a month. This should be your real goal — to use your ultrasound twice in the morning, twice in the afternoon. Those four procedures will earn you about $400 per day, $2,000 per week, $8,000 a month! Disclaimer: We obviously cannot control what your insurance companies reimburse you, nor can we control any changes made to Blue Cross, Medicare, etc. All we can do is advise you on what our clients are telling us they are being paid. You still need to do your own due diligence. By and large, however, most of our clients seem to earn far more than they first anticipated. And doctors worried ten years ago that the reimbursements might disappear, are still chugging along earning great incomes with their ultrasounds. We don't anticipate the reimbursements going anywhere. But we clearly cannot control that.